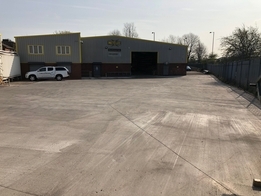 Metelec - Yard Completed ! Mission completed, customer service not disrupted and all achieved through everyone working together throughout the company by remaining focused on the overall objective and recognising the need to pull together whilst the disruption was upon us. Zero accidents and managed excellently by all involved, the new yard will serve us well as we continue to grow as a company. A note of thanks also goes to our neighbor's Proactive Industries who were also tolerant of the disruption.